Timeis running out for NASA?s stuck Mars rover Spirit as engineers prepare to maketheir final attempts to rescue the hard-luck robot from its Martian sand trap. 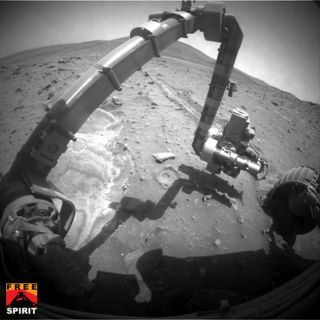 Spiritspun its wheels extremely slowly Tuesday in yet another attempt to extricateitself from the wheel-deep sand it has been stuck in since May 2009. Engineersare studying the results of that drive to decide which of the few remainingoptions to try next. Sofar, nothing NASA has tried has worked to freeSpirit. "Earlierdrives in the past two weeks using wheel wiggles and slow wheel rotationproduced only negligible progress toward extricating Spirit," NASAofficials said in an update. Spiritand its robotic twin have been exploring different parts of Mars since January2004 and far outlasted their initial 90-day life expectancy. Opportunity isworking fine on the plains of Meridiani Planum and headed for a giant cratercalled Endeavour, but Spirit has seen better days. Therover's wheels slipped into deep Martiansand on May 6, 2009 and have been stuck in place ever since.Spirit?s robotic arm is too weak to push the rover up and out, and attempts todrive out have repeatedly failed, rover engineers have said. Spirit?sbum right-front wheel hasn?t worked properly since mid-December (when engineersswitched it back on for the first time since 2006) and the rover?s right-rearwheel has been broken since November. That leaves the six-wheeled rover withonly four workingwheels, and only one operating wheel on the right side. Engineersat NASA?s Jet Propulsion Laboratory in Pasadena, Calif., are now looking attheir short list of options for rescuing Spirit. Thoseoptions include driving Spirit backwards and using the robotic arm to sculptthe Martian sand directly in front of the rover?s left front wheel ? the onlyworking wheel within reach. It could take several days to try either option,and time is short since winter is approaching on Mars. Theamount of power produced by Spirit?s solar panels has been dropping each day asthe Martian days, or sols, grow shorter in southern Mars. "IfNASA does determine that the rover will not be able to get away from itscurrent location, some maneuvers to improve the tilt toward the winter sun mightbe attempted," mission managers said.